How mechanisms for inclusive governance are understood is built on the framing choices that are made about governance and that which is being governed. 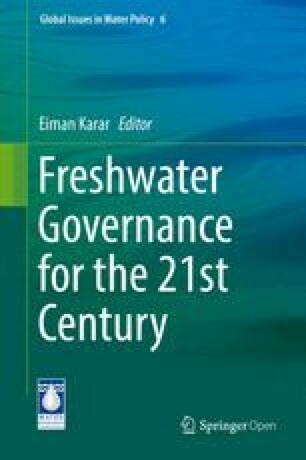 This chapter unpacks how governance can be understood and considers different historical and contemporary framings of water governance. A framing of “governance as praxis” is developed as a central element in the chapter. What makes governance inclusive is explored, drawing on theoretical, practical and institutional aspects before elucidating some of the different mechanisms currently used or proposed for creating inclusive water governance (though we argue against praxis based on simple mechanism). Finally, the factors that either constrain or enable inclusive water governance are explored with a focus on systemic concepts of learning and feedback. We were invited to address the topic of “mechanisms for inclusive governance”. In many ways this is a loaded title as it comprises three terms that cannot be taken for granted: “governance”, “inclusive” and “mechanism”. For us the pivotal term is governance which, as a contested concept, requires an appreciation of how it might be framed and the possible implications of a given framing choice. Expressed in this way, it is also necessary that we say what we mean by “framing” and “framing choice”. In turn, our title leaves open, and thus potentially ambiguous, the question of what is being governed – a river, a catchment, a complex adaptive system, etc. Resolution of this question involves a second set of framing choices. The question of inclusivity can only be addressed conceptually once the former issues are resolved. Questions of how framing happens at the start of any activity and who is involved are suffused with power with both practical and theoretical implications. In making our claims, we appreciate that there are multiple pathways to inclusivity in a given context and no blueprint or panacea; what is or is not inclusive will be open to interpretation and contextual design. The term “mechanism” has been the subject of intense critique in science studies and certainly cannot be used non-reflexively. It would be unfortunate, for example, if policy-makers and practitioners in water governance felt that they could do their job by selecting elements (e.g. tools, techniques, methods) to combine in simple, mechanistic ways. Our antidote to the trap of mechanism is to recognise that every concept, theory, tool, technique or method always has a user and that this use always happens within a context and for a human set purpose (Fig. 9.1). It is the relational dynamic depicted in Fig. 9.1 that constitutes what we will call a practice performance, though this is a very basic form – usually it is far more complex with multiple actors, tools, techniques, theories, etc. When the performance involves the conscious but practical use of theory, we call that praxis. The next part of our chapter, Sect. 9.2, addresses framing, explores how governance can be understood and considers different framings of water governance, in particular how these “framings” have developed over time and can be shaped, or transformed, through practical, inclusive, processes. The section also puts forward the framing of “governance as praxis” for discussion throughout the chapter. Section 9.3 addresses what makes governance inclusive, drawing on theoretical, practical and institutional aspects. In Sect 9.4, we deal with some of the different mechanisms currently used or proposed for creating inclusive water governance. Finally, in Sect. 9.5, the factors that either constrain or enable inclusive water governance are explored with a focus on the constraints to, or opportunities for, systemic water governance. A frame is the context through which a person interprets the world, also known as his or her perception, perspective, worldview, mental model, script or schema (Schön and Rein 1994; Isendahl et al. 2009; Dewulf et al. 2009). 9.2.1 Why Start with Framing? It is generally not appreciated that there are choices that can, and need to, be made as any practitioner engages with a situation of concern. Failure to recognise agency in framing one’s practice and the situation of concern leads to loss of transparency, inefficiencies and, too often, conflict, e.g. competing frames arise around contested topics and concepts, such as social-ecological systems, or resilience (McEvoy et al. 2013). Both governance, as a practice, and choices over that which is governed exemplify this conundrum. Power over others is manifest when one group or set of interests control how a concept (e.g. social ecological system), issue or problem is framed to the detriment of other stakeholders. Framing failure occurs when policy-makers and researchers fail to recognise that they have agency, and thus choices, about how to frame situations of concern; inclusive framing failure happens when those responsible for a policy, or other forms of purposeful action, fail to appreciate that inclusivity begins with opening up opportunities for diverse stakeholders, holding multiple perspectives, to be involved in making framing decisions, e.g. is a catchment framed as a hydrological system, an ecological system, a social-ecological system, etc. It is because of the practical and ethical implications of framing choices that we want to make our own choices in writing this chapter as transparent as we can. At its most basic, governance can be understood as an abstract and descriptive concept or alternatively, in its verb form, “governing” as a form of practice that has to be carried out in unique ways in multiple contexts and at multiple scales, e.g. across and between national, regional and local levels (Wallis and Ison 2011a, b). In recent history, the framing of rivers and/or catchments (terms which are framing choices in themselves) has been largely the province of hydrologists, engineers, physical geographers and, more recently, ecologists (Molle 2009). These are the framing choices on which integrated water resource management (IWRM) has been largely built. Too often these choices have had the consequence of restricting conceptually and practically, in governance terms, water to the river channel (e.g. through focusing on water quality and biodiversity). For example, historical framing choices currently constrain the activities of the English Environment Agency as it grapples with implementation of a new catchment-based approach because it is administratively not able to deal with water in the landscape (the province of another government body). Most significantly though, past framing has failed to account for the social in relation to the biophysical and, where present, treating it as an add-on rather than integral to the question of what has to be governed (Ison et al. 2007). All thinking and talking involves ‘framing.’ And since frames come in systems, a single word typically activates not only its defining frame, but also much of the system its defining frame is in. Moreover, many frame-circuits have direct connections to the emotional regions of the brain. Emotions are an inescapable part of normal thought. Indeed, you cannot be rational without emotions. Lakoff’s claims are insightful as they draw attention to the systemic consequences of framing choices including the effects both cognitively and physiologically on the user of a framing choice – which includes both speaker/writer and listener/reader. In other words, it is not possible to avoid the situated and embodied nature of our engagement with the world, for which we each must take responsibility (Ison 2010). Ison et al. (2015b) demonstrate how metaphor theory could be used in practical ways to enhance inclusivity in framing choices; failure to unpack framing assumptions when working collaboratively can undermine governance effectiveness. Of course this also includes how governance or governing is framed. In the title of his paper “the new governance: governing without government”, Rhodes (1996: 652) makes the first major distinction we wish to reinforce, i.e. governance is not the same as government. Rhodes (1996: 652–3) points out that “governance signifies a change in the meaning of government, referring to a new process of governing; or a changed condition of ordered rule; or the new method by which society is governed”. He goes on to outline six different uses of governance: “(i) as the minimal state; (ii) as corporate governance; (iii) as the new public management; (iv) as “good governance”; (v) as a socio-cybernetic system; and (vi) as self-organizing networks”. These categories are clearly not mutually exclusive. Rhodes’ (1996) categories, and those of other authors like Steurer (2013), could be used to create a typology of governance. However, we are wary of typologies that become reified as classificatory schemas (Ison 2010), instead favouring inquiry into the concept of governance (and other concepts) that reveals (i) the epistemological commitments that are being put to use when a concept is used (e.g. see Ison et al. 2013a for a discussion on the concept of social learning) and (ii) the elements of praxis, or enactment of governance (a governance/governing performance) and where praxis is understood as context-sensitive, theory-informed practical action (Ison et al. 2014a). Such an inquiry may reveal praxis features in all or none of Rhodes’ six categories which could then be used to inform innovations in practice in contextual and purposeful ways. In our experience, debates about the structures and definitions of categories do little to enhance praxis. Many but not all authors recognise the historical links of the term “governance” to the act of steering; usually, it is claimed by state and non-state actors (e.g. Steurer 2013: 388). However, not many authors make the connection between governance and the Greek word “kybernetes” (from which cybernetics is derived) meaning helmsperson or steersperson as in sailing a boat. Thus a governor can be understood to regulate a steam engine’s function in response to feedback or a sailor may chart a course in response to the complex interdependencies that connect them, via feedback processes, with wind, current and human purpose. It follows that governance may be mechanistic in response to complicated situations or systemic in response to complex situations in the sense used by Snowden and Kurzl (2003) to differentiate between complicated and complex. The choice of a cyber-systemic lineage of framing governance issues which we adopt in this chapter is not new (e.g. Blunden and Dando 1994) but is possibly neglected or poorly articulated in recent governance discourse (e.g. Rhodes ibid). Within this framing, our central organising metaphor is of a helmsperson (sailor) steering, or charting, an ongoing viable course in response to feedback (from currents, wind, etc.) and in relation to a purpose that is negotiated and renegotiated within an unfolding context, i.e. in response to uncertainty (Cook and Yanow 1993; Ison 2010). It is in relation to questions of purpose and who participates in agreeing purpose that inclusivity becomes central, both practically and theoretically. Other dilemmas appear in the governance literature such as that articulated by Steurer (2013: 388), as “who steers and how”. Whilst questions of “who” and “how” are vitally important, they must, in our view, be systemically related to questions of “what” and “why”. Consistent with systems theory, we choose to understand why/what/how as a nested hierarchy equating to supra-system/system/subsystem (Fig. 9.2). “What” relates to a purposeful framing choice, e.g. a catchment understood as a hydrological system, a social-ecological system, a complex adaptive system, etc. – but it is important to understand that a system is not some pregiven entity, but a device that is created so as to learn about, or change, a situation of concern from a systemic perspective; “why” relates to the purpose of the system as understood by those who want to learn about or change the conceptualised system of interest. For a given “what”, there are multiple “hows”. Working in the Cooum River, Chennai, India, Bunch (2003) exemplifies how using soft systems methodology (SSM) these systemic concepts can be used with stakeholders to effect improvements. Conceptually “who” is in another domain – in some contexts “who” can equate to a “how” (e.g. by engaging stakeholders in a situation of concern), but within second-order cybernetic understandings (Ison 2010), the answer to “who” is present in every saying and doing; the “observer” is always present even if social practices, particularly practices associated with doing science, abstract them away. In this regard, we as authors are present in what we say and acknowledge responsibility for our saying/writing. From this perspective, there is no external, objective, observer position, i.e. we are all situated in what we do when we do what we do. Our position has broader implications for understanding inclusivity which is not just a question of “who” but also “when”, i.e. is consultation tokenistic after “what” and “why” have been decided, or do a full range of potential stakeholders participate in effecting “why” and “what” through active citizenship that develops eco-literacy and processes that deepen democracy? Put another way, inclusivity is creating the means for taking and enabling responsibility, including for one’s own practice. Figure 9.3 is a heuristic developed to facilitate a conversation about what practitioners do when they engage in their practices, e.g. governing water catchments. It is important to understand this dynamic to begin to fully appreciate (i) how framing operates, (ii) the implications of particular framing choices, and (iii) how governance might be enacted in relation to chosen framings. The systemic implications for framing choices can be understood by exploring Fig. 9.3. If policy-makers (e.g. government agencies) and outsider researchers are understood as those on the left who bring their politics, theories of change and implicit and explicit theoretical and methodological understandings (e.g. disciplines) to the collaborative situation (programme, project, catchment management agency, water users association, etc. ), they face local people (extant stakeholders or those whose stakes need to be built) who too have their politics, theories of change, etc. Then of course there are the differing cultural traditions of the researchers, administrators, local actors, etc. One pervasive and ultimately divisive division is that between biophysical and social research/researcher traditions (Ison et al. 2013c). Programmes, projects and NRM agencies – in fact any purposeful human action in the field of natural resource management (NRM) to succeed – must be capable of creating an effective performance (a relational dynamic) amongst these multiple actors just like the players in a new band or orchestra. Our framing rests on the acknowledgment of uncertainty and the realisation that it is the quality of the relationship between the social and the biophysical as revealed in different trajectories that now warrants attention. As a means to unpack this relational dynamic, we have invoked the Janus metaphor (Ison et al. 2014b). Janus was the Roman god of gates, doors, doorways, beginnings and endings. What the Romans realised in admitting Janus to their Pantheon of Gods was the eternal flow and connectedness that is central to our world – that for every outside there is an inside. Janus is an antidote to the trap of language and thinking that arises when we name, and think of, things in isolation from the processes of which they are a part (Koestler 1967, 1978). In other words, when actions are isolated conceptually, practically and methodologically in a project situation (outside) from the same set of considerations in programme and project framing, design and conduct (inside), then systemic coherence can too easily be lost, e.g. whether the outside research team has the right mix of social and biophysical scientists and thus the requisite skills set that such mixes enable (Ison et al. 2013c, 2014b). Systemic coherence between the outside of on-the-ground projects or agency operations and the inside of programme design and logic, what is increasingly referred to in the literature as the “programme theory of change”, is we will argue a matter of achieving the systemic governance of a series of nested purposeful activities that could be framed as ongoing inquiries, as medium-term programmes or short-term projects. However, projects as an institutional form are no longer adequate for achieving effective, long-term systemic governance (Ison 2010). Instances where nonstationarities are fundamentally uncertain or chaotic pose a qualitatively different problem. With respect to climate, for example, it has been hypothesized that the addition of carbon dioxide to the atmosphere will alter the hydrologic cycle. Details of future change – magnitude, sign, timing, and location – are unknown, and possibly unknowable, even for large watersheds. Given such “information” what, if anything, should one do? based on the scientific uncertainties that exist with respect to climate change at practical, spatial, and temporal scales, and existing challenges …, we conclude that climate change is better understood as a cause for humility [rather than for physics] and caution, and that model-based scenarios of future climatic conditions are unlikely to make a quantitative contribution to our physical understanding. Galloway (2011: 563) reports on a meeting of US water professionals which sought to address the “death of stationarity” and the implications for their praxis. He says: “Two decades ago they would simply have turned to the Interagency Advisory Committee on Water Data Bulletin 17B (1982) to produce an estimate of 100-year and other flood flows, knowing that stationarity permitted them to create a statistical estimate of their threats.” This is a good example of climate change triggering awareness of the need for institutional transformation. Amongst their conclusions was that future “change will necessitate new approaches in planning”, i.e. “(a) dynamic design – pick the plan that is effective in meeting multiple plausible futures and (b) [the] need [for] a new, multi-disciplinary attack on water resources planning and management – we need a new paradigm” (p.564). Galloway (ibid) notes, however, that there is conflict over future direction and that most hydrologists continue to use techniques that assume stationarity. Performances and designs built on stationarity and fixed knowledge forms give rise to systematic (i.e. linear, step by step) practice rather than systemic practice that is relational, recursive and circular and characterised by feedback processes, learning and adaptation (Ison 2010). In other words, traditional framings used in water/catchment governance are no longer adequate to our circumstances. As the commentators cited above argue, new understandings and practices (new paradigms) are needed. What a river/catchment is taken to be is undergoing a shift of historical proportions as exemplified in a move from the framings on which IWRM rests (see below) to the governance of a social-ecological system. The use of the concept “nexus” is a further shift in framing choice exemplified by Campbell (2014) when he spoke about “converging insecurities of food, water, energy and climate, and their implications for 21st Century farming systems”. In our Systemic Governance Research Program (SGRP) and CADWAGO research (see http://www.cadwago.net/), we are exploring the implications of framing governance in terms of the theory-informed practices (praxis) that can give rise to effective performances amongst multiple stakeholders in contexts of uncertainty and surprise (Ison and Wallis 2011; Ison et al. 2013b). A performance as in a good team, an orchestra, dance or play demands inclusion of the “right actors”. 9.3 What Makes Governance Inclusive? This section addresses what makes governance inclusive, drawing on theoretical, practical and institutional aspects. To address the idea of inclusivity, we do not draw our boundary purely in the social domain but instead prefer a framing of a river/catchment as a structurally coupled social-biophysical system (Fig. 9.4). Please note we are not claiming that catchments are these types of systems but that it makes sense to frame them as such whilst recognising that other framings may also have utility. We choose this framing because of experiences of confusion around the concept social-ecological system, especially as to how boundary judgements (to the system) and relational dynamics are understood. Our framing choice does not treat a social-biophysical system as a single entity or system, but as a relational dynamic between two systems mediated by human-invented institutions (rules of the game) and technologies. This framing is also an act of inclusion as it recognises the systemic, relational dynamics between people and their biophysical environments as well as distinct relational dynamics within a social and a biophysical system (Figs. 9.3 and 9.4); situational framing sets the key initial starting conditions which give rise to inclusivity, or not. Within our preferred framing, concerns like “biodiversity conservation” are means of influencing the unfolding dynamic between the social and the biophysical through the design and use of new institutions that serve human purposes in relation to conservation, e.g. the institutional forms of “ecosystems services” if they become widespread are likely to have a major impact on this unfolding dynamic (Ison 2011). Framing choices and awareness need to operate at multiple levels and in relation to situations and practices. We have outlined our framing preference for the situations that have to be governed – structurally coupled social-biophysical systems. However, how these might be governed requires another framing choice – here our preference is to see governance situations as akin to “wicked problems” or situations characterised by complexity, uncertainty, interdependencies, and multiple perspectives where what is at issue has to be constructed by concerned stakeholders (Ison et al. 2007, 2015a). Thus, what is, or is not, inclusive is related to the locked-in historical features of a situation that can create pathway dependencies and to initial starting conditions associated with a new issue or an emergent concern or crisis. As practice in relation to situation unfolds, there are multiple opportunities for being inclusive or not. Here we outline three matters that if not understood can affect inclusivity. In research for development (R4D) and water governance circles, the concept of “theories of change” has begun to shape almost all praxis because of how it is linked to monitoring and evaluation (M&E) of projects and programmes and thus measures of success and funding. Because of the power this concept has been given and because it is in some ways foundational to praxis, we explore it here. Figure 9.3 can be used to unpack the various understandings that can be attributed to a “theory of change”. Unfortunately, all too often this term has come to mean the systematic coherence between the “outside” of on-the-ground projects and the “inside” of programme design and logic, i.e. it has become a mechanism known as the “programme theory of change” to test ex ante what a programme design will deliver or the impact it will have. At its crudest, a “theory of change” diagram (as they are usually expressed) is a more sophisticated form of a project logframe. At its most sophisticated, “theories of change” are concerned with an ex ante (and continuing) process of inquiry that surfaces different worldviews amongst multiple stakeholders, usually in designed “theories of change” workshops. For example, Coover et al. (1977) advocate exploring elements of a theory of change so as to clarify purpose and to establish what would be regarded as success. Their elements include a consideration of the nature of human beings; the nature and sources of power, truth and authority; an analysis of causality of social problems; roles of individuals and institutions; visions of how change can occur; and mechanisms for change. These elements might well be adapted to use in the context of catchments framed as we have chosen. Earlier sections of our chapter are, we claim, very practical because all issues we raise underpin the theories of change that different stakeholders hold. The point is that the more that an individual or group’s “conceptual baggage” and epistemological and theoretical commitments (e.g. local knowledge, cultural knowledge, scientific knowledge) are surfaced within a conversation or dialogue, then the more the inclusivity deepened and the conditions for building a creative and effective performance emerge (Ison and Russell 2000). Inclusivity gets nowhere unless these issues are appreciated and addressed. In turn, how learning is understood and thus enabled is shaped by theories of change and learning. Within social theories of learning (in contrast to older, cognitivist theories), learning emerges from the dynamics of social relations (Blackmore 2007). In researching social learning from this theoretical understanding of learning, what changes through inclusivity are the practices and understandings of those involved as they construct and transform what is at issue (Fig. 9.5). Participation is a necessary but not sufficient condition for social learning to happen (Carr and Wilkinson 2005; Collins and Ison 2009, 2010; Collins et al. 2009). Much has been made of Arnstein’s (1969) ladder of public participation, where participation is conceptualised as power. Various models of participation have been institutionalised, such as the International Association for Public Participation (iap2) spectrum of participation, commonly employed in the public service as guidance for engaging citizens. Critique of ladder or spectrum metaphors emphasise their oversimplification, a lack of learning or feedback mechanisms, hierarchical framing and, in particular, a lack of context in which participation is situated (Collins and Ison 2009). Social learning within the SLIM research tradition moves beyond participation and is understood as both a social dynamic that transforms situations and a governance mechanism that can be invested in – much like a city’s orchestra (see Colvin et al. 2014; Ison et al. 2013a). Inclusivity is thus more than a participation as those constraints to, or enablers of the shifts in understanding, and/or practices crucial to social learning have to be addressed. Institutions are the most significant constrainers or enablers of changes in understanding and practices. Adopting North’s (1990) understanding of institutions as “rules of the game”, we find that some rules are more inclusive than others and also that there are advantages to regarding institutions as a form of social technology in the sense depicted in Fig. 9.1. Institutions understood as technologies enable a questioning of the mediating role that they play in relation to practice rather than entities considered in isolation. Institutions for governing water resources range from stringently defined legislation and regulation, to more flexible forms such as organisations, community groups, projects or policies, to emergent phenomena such as markets or different “types” of water (e.g. potable water, wastewater, etc.). In catchment management, institutions are pervasive and resolve into a high degree of complexity (Wallis and Ison 2011b). This section deals with some different approaches that are currently utilised or proposed for creating inclusive water governance. Traditional framings, we claim, are not inclusive, whereas the examples following tend to open up the possibility of inclusiveness though do not guarantee it. These are not mechanisms in a mechanistic sense; rather they represent different framings potentially conducive to inclusive governance; they are mechanisms in the sense that they are choices that can be made purposefully, but they are not “blueprints” to be followed mechanistically through rule-based procedures. As we outline in the last section, these framing choices create contexts for systemic innovation and design. Each, as domains of praxis, has developed particular tools, techniques, institutions, metaphors and methods which when used effectively can facilitate inclusivity – we exemplify some of these in the final part of this section under the rubric of “modalities of practice”. IWRM is considered to be a central concept in contemporary water governance (White 1998; Lubell and Edelenbos 2013). The key feature of IWRM is “integration”, which is a normative goal that can refer to the integration of fragmented responsibilities for water governance (functions), institutional fragmentation (e.g. Wallis and Ison 2011b) and societal fragmentation (Lubell and Edelenbos 2013). The latter, societal fragmentation, is characterised by a disconnect between those making decisions and those affected by them. IWRM promotes stakeholder participation through some platform or institutional arrangement that promotes inclusion. However, as Warner (2006) found in an assessment of multi-stakeholder platforms in managing catchments, a realistic assessment of their purpose and capacity to achieve this ought to be considered before initiation. A finding from SLIM research (Ison et al. 2007), in which 14 empirical case studies of water governance platforms were undertaken, was that the existence of a multi-stakeholder platform, i.e. of multi-stakeholder institutions, did not guarantee effective performances that could be said to constitute social learning. How is IWRM suited to governing the relational dynamics between people and their biophysical environments? One enduring challenge that Molle (2009) highlighted is managing interconnected and nested biophysical landscapes with disconnected administrative and social systems. Inclusiveness in IWRM could help “connect” social systems, achieving a greater variety of participants particularly through inclusion of people with local-scale interests. Institutional barriers, such as the centralisation of policy and lack of support for local capacity to implement IWRM (Medema et al. 2008), are both impediments to and arguments for greater inclusiveness. Despite the duration of IWRM as a governance framing choice (White 1998), what has not become clear is a praxis (or praxeology) of IWRM including the institutional forms needed to support this praxis. In this framing, the perennial issue is how to address the question: what do actors need to experience to claim that integration has occurred? In our experience, this question is rarely addressed well, in situations where integration is sought or claimed. As Fig. 9.6 depicts, there are a range of stages to SAM each employing different methods, techniques and tools. The quality of engagement is regarded as a key first step, i.e. inclusivity, although the criteria for, and thus the boundaries of, inclusivity are not always elucidated in reports on SAM. Nonetheless, there is evidence, in the rivers of Kruger Park in particular, of a “closer working partnership between researchers, managers and field staff with buy-in [to the SAM approach] and co-learning” (Pollard et al. 2011). As with all method innovation, it is important that users do not fall into the trap of thinking of SAM (or other approaches) as blueprints to be blindly followed; praxis that is methodologically robust always involves the adaptation of the method (and its constituent elements) to a given context, and all users should be open to theory-informed innovation whilst avoiding the ad hoc addition of tools and techniques. Whilst the concept of social learning can be represented through a variety of metaphors (Ison et al. 2013a), we opt to use it in the sense of creating a governance performance that can frame learning amongst stakeholders in social-biophysical systems. This process is depicted in simple terms in Fig. 9.5. As with any praxis that is performative in nature, the effectiveness of the performance is a product of, as well as a producer of, social relationships between those involved – something we have described as building relational capital. In contrast to the traditional governance approaches of regulation, information and markets where fixed forms of knowledge are applied to manage natural resources, social learning offers a chance for inclusive learning about and acting to improve situations (Ison et al. 2007; Collins and Ison 2009). In this sense, social learning can be understood as both governance mechanism, something to invest in like the orchestra of a city, and a social dynamic between different actors with different instruments who strive to create a performance that is agreed to be effective for the context or issue. As Wallis et al. (2013) describe, social learning is not necessarily new – they provide evidence of social learning from a Salinity Pilot Program Advisory Committee in Victoria, Australia, that evolved under a particular set of historical circumstances. “Effective performances” were built in addressing salinity at catchment scale, but the understandings, practices and institutional arrangements that enabled this to happen have been largely lost to the current generation of policy-makers and practitioners. This exemplifies a failure to institutionalise learning. experimenting with and progressing innovative second-order modalities’ of dialogue (those forms of conversation in which there is a reciprocal ‘turning together’ as in some dances) and learning through various forms of deliberation across relevant organisations. A key focus [being] how policy makers, policy implementers and scientists might better work and learn together, and the specific skills and practices the new modalities require. In Table 9.1, seven modalities of practice are described which could, in theory, be used within any governance framing, but, when used effectively and with contextual understanding, have the potential to enhance inclusivity. We caution against interpreting these as tools – unless one understands that all tools have a use context and a user that is generally unique. The examples within Table 9.1 are by no means exhaustive, and as argued by Ison et al. (2011: 3984), “no modality can be considered successful in and of itself, as success will be derived from an awareness of context and the generation of performances fit for circumstances”. This final discussion explores the factors that either constrain or enable inclusive water governance, with a focus on those factors which currently constrain shifts towards systemic governance. It is important to realise that despite considerable research activity which has generated conceptual and methodological innovation for inclusive governance of rivers/water catchments, there are limited examples of sustained, inclusive, “governance performances”. We make this claim despite the very large effort and resultant literature devoted to participatory approaches. Why is this the case? The answer is of course multifaceted. The following are, from our perspective, key constraints to governance innovation that secures inclusivity in a sustained, ongoing manner. Persistent, inappropriate framing failure: As argued by Jorgenson and Steir (2013: 15), practitioners, in whatever domain, must take responsibility for their invitations and context setting as well as how their frame is heard and acted upon by others. They argue for taking seriously “Schön’s (1983) notion of ‘reflection-in-action’, responding in the moment to divergences in frame setting that we as good listeners, allow ourselves to hear”. Drawing on the insights of Gregory Bateson, these authors note how framing occurs at multiple levels and involves attention to the presence and acceptance of ambiguity and paradox as crucial sources of novelty, or innovation, which are essential when responding to uncertainty. Boundary judgement failure: Whenever the concept “system” is invoked, then a boundary judgement as to what is system and what is environment of the system, as mediated by a boundary judgement, must be made. Otherwise the concept “system” is virtually meaningless. Once recognised as a key element of praxis, then it becomes critical to address the question of “who participates in making the boundary judgment(s)?” (Ulrich and Reynolds 2010). Unlike Huntjens et al. (2012) who refer to the need for boundary definition (as if systems pre-existed their formulation), we would argue for praxis that engages critically with boundary formulation and critique (see Chapter 12 in Ison 2010). Reflexivity failure amongst practitioners and policy-makers: By reflexivity, we mean the second-order process of reflection upon reflection. Reflexivity, as praxis, is what is needed to purposefully move between single-, double- and triple-loop learning (e.g. Huntjens et al. 2012) – to make these terms more than category descriptions. As Schneider and Ingram (n.d.) argue, the role of policy analysts has not evolved to fit a new model of collaborative governance, instead remaining narrowly focused on “production of models, forecasts, causal analysis and experimental and quasi-experimental evaluation studies”. Schneider and Ingram (ibid) along with Ison et al. (2015a) also point to the constraints to reflexivity, and thus governance reform, posed by the sustained adherence to a “utilitarian rationality”, or what is sometimes described as “the high ground of technical rationality”, rather than descending into the “swamp of real-life issues” (Schön 1995). Failure to change patterns of investment and institutions of systemic innovation: In a climate change world where stationarity is dead, it makes no sense to sustain traditional investment patterns associated with the linear conception of problem → knowledge → regulation/education provision → monitoring → adoption/compliance. The evidence is that in environmental issues, it is easy to regulate but difficult and expensive to monitor and gain compliance. This historical model also means that upfront investment is generally low but that for effective compliance, costs increase over time, or new policies and regulations have to be sought, thus creating a treadmill of policy failure in the face of “wicked-like” issues (Ison et al. 2015a). Moves towards inclusive governance shift investment to the front end of purposeful action. Institutionalisation failure: Over 40 years ago, Rittel and Webber (1973) invented the terms “wicked” and “tame” to frame situations of concern to them as planners and designers, and despite growing recognition of consistent public policy failure in the face of situations they called “wicked” (APSC 2007; Ison et al. 2015a), institutional arrangements have rarely been put in place to engage effectively with these types of situations. This is an example of persistent institutional failure and is part of the motivation for authors like Huntjens et al. (2012) and Ison et al. (2015a) to propose institutional design propositions for operating in a climate change world. As depicted in Fig. 9.1 though, institutions (as social technologies) must go hand in hand with praxis innovation. Institutionalisation failure needs to be separated from the failure of institutional innovation – the crafting or designing of new institutions (Ison 2014) that are more fit for purpose, e.g. there is considerable research pointing to the value of voluntary organisations such as the Tweed Forum (on the English-Scottish border) aiding more systemic water governance (Collins et al. 2007; Cook et al. 2013; Rouillard et al. 2014). Failure to understand theoretically how learning operates, or could operate, for collaborative governance and adaptive managing and how feedback processes are central to ongoing praxis and institutional innovation (Blackmore 2007; Pollard et al. 2011). Pollard and Du Toit (2011) exemplify what is at issue. In a 3-year study in six major catchments in the water-stressed north-east of South Africa, they examined factors constraining or enabling implementation of adaptive water management. They concluded “that self-organisation and responsive multi-scale feedback loops are essential for management in catchments understood as complex systems as they provide the basis for learning and response to an evolving context”. Successful feedback processes included: “meeting the requirements of the law (the Reserve), the availability of benchmarks against which to monitor (the ‘[Environmental] Reserve’, albeit a static value), the presence of a ‘watchdog’, the responsiveness of the manager and users, communication and the ability to self-organise and self-regulate” (Pollard and Du Toit 2011: 4019). As identified by these authors, too often feedback processes are fragile, often depending on single individuals, and thus are prone to breakdown. Also they may be confined “to a local scale and lack key supportive linkages to wider scales that would confer strength and resilience” (ibid). Failure to take the “design turn” in doing and enabling governance and governing: We use the word “turn” here in a similar way to those who advocate taking a “critical turn” – i.e., a change in how we appreciate a situation and subsequently engage with it by incorporating a new (second-order) awareness. A “design turn” opens up a space in which we can reflect on our engagement with a situation as a product of our own design; i.e. rather than adopting a preconceived set of ideas or principles embodied in a given approach, such as project management, we start to appreciate the options we have available for engaging with a situation in different ways and start to adjust (design) our approach to the specific dynamics, requirements and constraints of the situation. However, it is not only practice (governing) that has to be developed and changed but the context of practice (governance). Failure to consider both can place change efforts on a pathway to systemic failure. For example, Table 9.2 shows one of five general lessons and specific elements that Measham et al. (2009) derived from their research and engagement with the sparsely populated Lake Eyre Basin community, in arid, central Australia. Each of the elements derives from experience and has meaning in the context of their generation, including amongst those who generated them. However, as expressed, they offer little to a would-be designer of an engagement process in another context because they are not expressed as design propositions nor linked to theories that enable them to be scaffolded into governance performances. Continuity: For Australia to be sustainable, it needs an enduring, countrywide NRM delivery infrastructure. Subsidiarity: Devolve decision-making to the lowest capable level. Integrated goal setting: Base investments and governance mechanisms on coherent, nested and integrated goals. Holism: Plan to address whole systems. Systems approach: Match governance mechanisms to the nature of the linked social-ecological system. Relationship orientation: Recognise that relationships are as important as organisations. Resilience: Manage for resilience of ecosystems and communities. Knowledge and innovation: Equip the governance system with skills, capacity and knowledge, and encourage innovation. Accountability: Base the case for investment and accountability on sound systems data and knowledge. Responsiveness and adaptability: Regularly review and adapt the whole Australian NRM governance system. Material presented in this chapter has the potential to enhance and/or refine these design principles. Failure to invest in capacity and capability building and demand creation for the right skill sets: Attempts to articulate an agenda for skill, capability and thus capacity building for inclusive water governance have been made in the past (e.g. SLIM 2004). However, it is not apparent that relevant curricula are widespread, or that investments are being made, to develop appropriate capabilities.1 The challenge of governing water is complex, and thus the research needed to inquire into water governance situations necessarily comes from diverse disciplinary perspectives, as well as multi-, inter- and transdisciplinary research perspectives (Roux et al. 2010). Capabilities for doing transdisciplinary research needs to be built early in the careers of water researchers, as one group of early-career researchers claim in Patterson et al. (2013). This includes not only the abilities of the individual researchers but also the institutional settings in which research takes place, whilst the formation of self-organising communities of practice can help support cohorts of water researchers in achieving reflexive and inclusive research practice. It is not only researcher understandings and practices that need to be enhanced; similar arguments apply to policy-makers and those involved in sector-wide professional practice. For example, Patterson et al. (2014: 1) developed a framework for assessing “enabling capacities” for facilitating collective action in catchment management contexts, which included “prior experience and contingency, institutional arrangements, collaboration, engagement, vision and strategy, knowledge building and brokerage, resourcing, entrepreneurship and leadership, and reflection and adaptation”. They found that the interplay between several of these identified capacities was important for the emergence of “practical action”. Pollard and Du Toit (2011) found practice-based understanding of policy, the role of leadership and communication to be critical skill sets. Rouillard et al. (2014: 644) point to the need for fostering more in-depth reflection and learning during policy implementation (to which we would add development) but acknowledge that this would require more flexible policy and institutional arrangements that enable policy implementers “to work outside regulations and organisational targets, and build long-term relationships” with stakeholders. The eight points made above cannot be considered in isolation – they first have to be dealt with systemically (holistically) rather than systematically (in a linear, step-by-step manner). On the positive side, there is widespread ferment in water governance circles with many creative attempts to generate a new wave of governance reform, whether under the framings we have described here or others which have received less attention from us such as adaptive management, collaborative governance or collaborative co-governance. There is still much to be learnt about inclusivity from governance experiments now underway, whether in the Mekong Basin through M-Power (2012), the Limpopo River basin through RESILIM2, reforms of the Murray Darling Basin in Australia, implementation of the European Water Framework Directive, the currently stalled implementation of the innovative South Africa National Water Act 1998 or recent advances in transboundary water governance as described by Armitage et al. (2015). The elements to create and sustain effective inclusive, systemic governing performances are, we argue, already largely known, but yet to be embodied in the actions of practitioners and policy-makers within conducive and sustaining institutional arrangements. In the sense articulated by Whatmore and Landström (2011: 606), based on their work in the catchment of Ryedale (UK), it is not only the transformation of professional practice that has to occur but at the same time “facilitate the emergence of new kinds of public” that are capable of producing through their emergence, the power to object to, and intervene in, matters that concern them. An inclusive, systemic approach to freshwater governance begins by making the distinction between situation and system; no one governance situation is the same so contextual design and application are needed even if some of the principles and practices employed are held in common across contexts. When individuals, groups, organisations and governments engage with freshwater situations, almost overwhelmingly they bring their historical framing choices to the situation. Too often new terms are quickly adopted uncritically and used in ways that do not make clear the underlying conceptions held by different users of the language – in our research this applies to the concept “social ecological system”, “complex adaptive system” and the emerging discourse about natural capital, environmental assets or asset-based management (Coffey 2015). Language and concepts used unreflexively undermine inclusivity by capturing a particular framing at the expense of others’ framings, or by undermining effective collaboration because people speak at crossed purposes. It is because of the importance of initial starting conditions in a given context, and the need to know what these are, as well as paying attention to what will help create an effective governance performance (Ison and Wallis 2011), that we have devoted considerable attention to framing issues and the role of language in this chapter. In achieving sustained systemic governance, these are important practical considerations, not unimportant theoretical musings! As we noted at the beginning when citing Lakoff (2010), all metaphors bring forth an associated system. In other words, language precedes system; in fact the choice to see a freshwater river as a system is a framing choice – the system does not precede the choices that different actors make. In this chapter and in our research, we hope to have presented a narrative that supports our normative position – that it makes sense to see freshwater systems as coupled social-biophysical systems so that, in a human-induced climate change world, the relational dynamic between and within the social and biophysical will benefit from moving towards forms of inclusive, systemic governance. Innovative examples include http://www.watercentre.org/news/education/programs/master-of-integrated-water-management (Accessed 8th July 2014). We thank the Water Research Commission (South Africa) for the invitation to contribute this chapter – particularly Eiman Karar and Dhesigen Naidoo. Jitse van Ameijde provided insightful reflections on taking a “design turn” based on Open University teaching with RLI. The support of Monash Sustainability Institute for our work is acknowledged. Ison, R. L., Blackmore, C. P., & Collins, K. B. (2013b). Systemic governance practices (CADWAGO Project Brief for Work Package 3 (WP3)). http://www.sei-international.org/mediamanager/documents/Publications/CADWAGO-factsheet-WP3.pdf. Accessed 4 July 2014.